I was a week passed my due date. I was anxious, nervous, and scared… and excited all at the same time. The days passed and I thought I would be pregnant forever. I never really thought about labor, I think partly because of my history of pregnancy loss I never let myself think I would get that far, I was protecting myself I guess. But when I did think about it, I thought it couldn’t be that bad. But at the very end of my pregnancy… I started to get scared, really scared. I posted on forums asking veteran moms to share their labor experiences, I watched TLC’s: A Baby Story (Big mistake- terrified me), I googled things like “How bad does labor hurt”. I would soon realize that nothing could have ever prepared me. I was never an athletic person, the extent of my physical activity was a year or so when I became passionate about running (and I never ran more than 3 miles a day- but A for effort!) I’ve never really been seriously injured. Hell, I’d never even stayed overnight in a hospital before! I really did not know what real pain was. I was still going to work everyday (I will get on my soapbox about how I feel about the US’s broken maternity leave policy in a later post) so I was at work at 40 weeks and 5 days pregnant. At this point, I was getting afraid of having to be induced as I had heard horror stories about the drug Pitocin (brings on or strengthens labor contractions during childbirth) when I started to have regular period cramps about every five minutes. I had been having Braxton Hicks Contractions (“practice” contractions during pregnancy) pretty regularly the last few weeks or so and had thought that this was probably nothing and to not get my hopes up. Until I got home 8 hours later… and they had not stopped in their regularity. I clearly remember Vance Joy’s Rip Tide playing on the radio on my drive home, and I couldn’t help but cry because I was just so damn happy to have made it: I was going to be a mother. I was getting excited and my husband and I started to time them. By 8:00pm I was having to walk through the contractions. I started to feel a little uncomfortable being in pain around my husband, and went to my bedroom to be alone. Primal instinct maybe? When I realized that this was probably “it”, I called my mom crying, because well… I was scared. I called the doctor and like they do with so many women … brushed me off and said somewhat rudely “Well, you can talk on the phone so you probably aren’t in labor”. Why do nurses and Obstetricians make women feel like idiots when it comes to our pregnancies? We are not completely ignorant to our bodies, we know what is going on… and if it IS a false alarm, shouldn’t we really play it safe? But I digress…. I know they recommend to stay at home as long as possible, but I was anxious to get to the hospital and get settled in. I also started to worry about how the baby was handling the contractions and wanted to be monitored. I remember being afraid of getting in the car to go to the hospital because I wouldn’t be able to walk through the contractions. The only person I told was my mom because I have heard of so many women getting “sent home” because of a false alarm. I didn’t even bring my hospital bags inside when I got there because I was so convinced that this would happen. I was 3 cm and in the beginning phases of active labor. I was a little disappointed I was only 3 cm- all that pain for 3 lousy centimeters? I had thought maybe I would be one of those women you hear about who “barely make it to the hospital”. But nope, I wasn’t that lucky- I was just a wimp. I consider myself a naturalist of sorts and am not a huge fanof taking medicine if I can avoid it. But I always planned on getting the epidural. Everyone I talked to about labor, said one thing first: Get the epidural. In a no non-sense type way. Natural birth to me was unheard of, something only crazy, heroic women did. However, read Why I want an All Natural Birth for my next pregnancy. At this point it was around 1:00am, my mom had driven the hour and a half to the hospital and I was getting emotional. The contractions were getting stronger and I was really having to focus on getting through them with breathing. Contractions however are not constant. They come about every 3 minutes during active labor, last about a minute and you do have time to rest in between. I would chat with the nurses in between them, even laugh. I would have my husband yell out when it had been 30 seconds, so I knew I only had 30 seconds left to go. I remember that 30 seconds becoming longer and longer and l o n g e r…. About two hours later the morphine had worn off. I was dilated to 6cm and I remember being paralyzed by the pain. This was the “dark time”. There was no breathing through these guys, these were the real deal. The pain was downright traumatic. I was no longer chatting in between contractions, I was bracing myself for the next one. I was crying at this point and was asking for the epidural. Actually, yelling for the epidural. I vaguely remember the anesthesiologist asking me the routine questions, but crying so hard I could barely answer. If you think you are going to be afraid of the needle, trust me; you won’t be… they won’t be able to get that needle in fast enough. Epidural *cue love song here* What a relief…. I had tried to wait until I was dilated to 5cm because I had heard epidurals slow down the labor process if they were given before then. And partly, I think I just wanted to see how “tough” I was. I do think the epidural slowed down my labor (I will focus on all natural birth vs. epidural births in a later post), but I did continue to progress to 10cm without feeling a thing! I remember looking at my contractions on the monitor and having the very real thought that I would not have been able to endure them. I was terrified of the epidural wearing off and having to feel contractions again.. I kept asking the nurses in a trembling voice “it won’t wear off right? !” I think I asked them this 100 times. However, nothing is more empowering than hearing you are progressing in dilation, you feel that all of this hard work is getting you somewhere. You are proud and astonished at what your body can do. I wasn’t afraid or anxious – you are in the thick of this really physical process and there is no time to think. I had never felt the urge to push and looking back this kind of bothers me… what if I had meant to be pushing for an hour but the epidural masked the urge? Again.. a later post. I trusted the nurses though and believed them when they said they would know when it’s time. When the time came, I was ready. I can only describe it as being a boxer walking to the ring for the champion fight, full of adrenaline and anticipation. I’m smiling! Thank you angel named Epidural! My first attempt to push was unsuccessful, I don’t think I was mentally prepared to push yet and my daughters head kept getting pushed back up in the birth canal. Labor is in every sense mental as it is physical. The second I started to push, my contractions would weaken. I learned in birth prep class that something as benign as a new person entering your hospital room can slow your labor. The OB ordered to give pitocin to let my body do the work and push her down the birth canal so I wouldn’t get too exhausted pushing. Pitocin?! They may as well have said lethal injection. Pitocin was the scary drug! I had immediately said NO with fear in my voice. The OB was quite forceful with me and said “Are you going to listen to everyone else, or are you going to listen to the medical professionals?” The nurses and OB are very much in control of your labor process, to them it is their job to hand you a healthy, live baby at all costs. I think this is partly the reason I was not anxious or scared- I felt like I was in good hands. However, I have mixed feelings about doctors and nurses dictating how the birth process will go without listening to the laboring woman or exhausting the natural child birth process first (i.e. premature cesareans, early inductions), but again.. that post is here. It was about another two hours and the baby’s head was way down in the birth canal. The room was quiet and dark, and only the nurse and I were present when she had told me to try to push again. When she realized that I was pushing effectively and the baby was coming, she went to get my husband and mom who were waiting with other family members who had come to the hospital (Labor is usually a long process, and a restless time for your family). I could feel her head making it’s way down the birth canal. It was painful, it felt like something massive was stuck in my insides (Um duh). She went to grab the OB. I remember yelling at my husband and mom to “stop looking at me” while I was pushing, Oi. I strongly feel women can’t be held accountable for things said during labor – but they were smiling! How could they be smiling at a time of pure agony?! I later realized after hearing their accounts of the day, they were also going through this miraculous experience in their own way. The next few moments were kind of a blur, pushing was hard work (that sweat you see in the movies- yeah, that’s real) and painful-a different kind of pain compared to contractions, but painful nonetheless. My memory plays like this: a gigantic release of pressure: loud cheering: relief: exhaustion. My first thought was of how small she was. Newborns are TINY. I automatically could envision how she fit inside my womb and the big picture all just clicked: I understood the magic now. They whisked her away while the doctor did whatever she had to do “down there”. I had a vaginal birth with no tearing. Remember my dream? That dream stayed with me my entire pregnancy. I knew at my gender scan that the baby would be a girl and there is even a video of me hours before she was born with my Husband asking me what I think she’ll look like. I say matter of factly: She’s going to have light hair. I remember the first thing I asked was “What does she look like”. 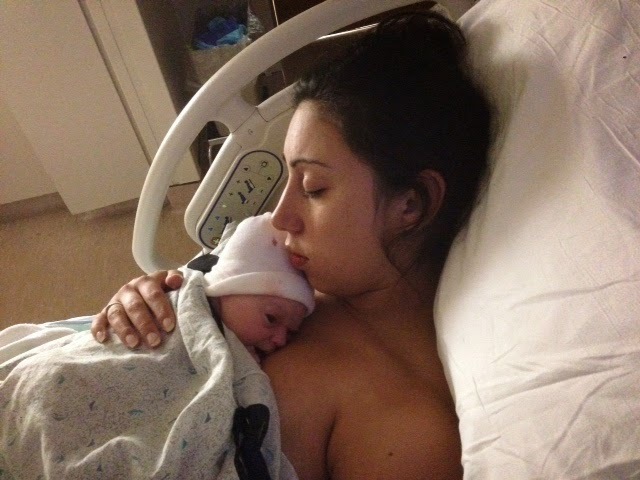 Like any woman who has just been through the crazy, life-altering experience such as labor (and for the last 19 hours! ), I was deliriously exhausted. I was afraid of delivering the placenta because I was afraid it was going to hurt again. There were many babies being born that Wednesday morning, because my OB could not wait for my body to deliver the placenta on it’s own and she manually retrieved it. Yes, she MANUALLY retrieved my placenta. Having someone literally IN your insides is an experience, let me tell you. But in an instant, all of the pain just simply dissipates. After doing all of the things they do when a baby is born, (What do they do over there anyway?- it felt like an eternity!) , they handed me this 7 pound, fair featured baby girl. She looked up at me and I saw fear in her eyes. I instantly felt remorse for just putting this tiny, fragile creature through something so traumatic. This memory is significant to me; I classify this feeling as my first maternal thought- love at first sight. Looking back at my labor and delivery today, I see amazement and feel an immense pride. If you talk to any woman who has given birth, they will all tell you the same thing. You feel super-human afterwards, capable of taking on anything. Strong. Empowered. Proud. You are ultimately changed forever. Your births will be a story you carry with you always, a badge of honor. I read a quote in the book titled Milk Memos that I felt described the experience of labor & delivery perfectly. This entry was posted in Birth, Childbirth, Labor, My Journey, Pregnancy, Pregnancy & Birth, Pregnancy loss and tagged My Journey.